Living in a dorm where everyone is right in close proximity can open you up to a lot of things. Unfortunately, one of those things happens to be colds. 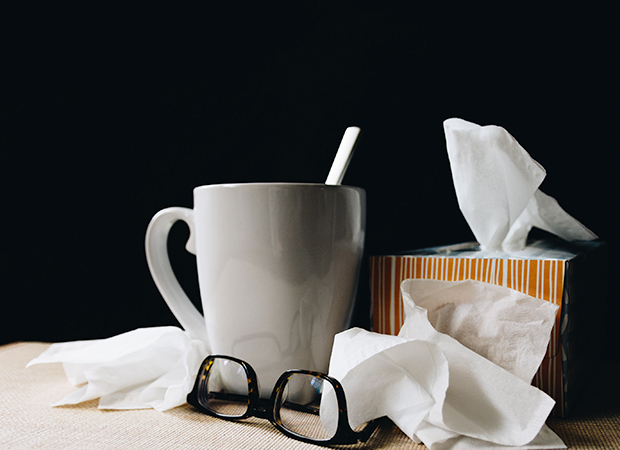 And while there is not yet a cure for the common cold, there are simple things you can do at home to get you feeling better and back on your feet in time for finals week. 1. If you have a sore throat, strange as it sounds, it’s a good idea to gargle warm salt water. Adding a 1/4 tablespoon of salt to 8 ounces of warm water, and gargling it in the back of your throat can help relieve the pain. The salt helps wash away the nasty things in your throat that cause inflammation and swelling, thus cutting down on the pain in your throat. 2. A cup of tea with honey, while not actually possessing any medicinal qualities, can be a huge relief when you’re all stuffed up and sniffly. Hot tea loosens up your nasal passages and allows air to flow through them again, much in the same way as a nice bowl of chicken noodle soup. 3. Vitamin C is a big one for the prevention and treatment of colds, or really any minor illness. Found in things like citrus fruits, and many fruit juices, it helps cut down on inflammation and mucous and speeds up the production of white blood cells, which in turn speeds up healing. You can also take Vitamin C in pill form as a supplement – Airborne was our savior my freshman year – but many foods, including strawberries, peaches, and broccoli, have a surprisingly high supply. 4. Of course, the classic Vick’s VapoRub always helps clear a stuffy nose and congestion. Applying it liberally to your chest or feet before bedtime can work wonders, and at the very least, ensure you’ll get a good night’s sleep, and not stay up half the night blowing your nose or unable to breathe. If you don’t like the messiness of the rub on stuff, they now have patches you can place on your clothing that have about the same effect. 5. And of course, the most obvious one of all: sleep. In order to fight the infection in your body, lots of sleep is a necessity. Shut your door and close the curtains, and you’ll be asleep in no time. Chances are, your roommates will leave you alone for fear of getting infected themselves so you can nap for hours in peace. College students are susceptible to illnesses, as well as other mishaps, so it’s important to take the proper precautions. Visit GradGuard for more information!